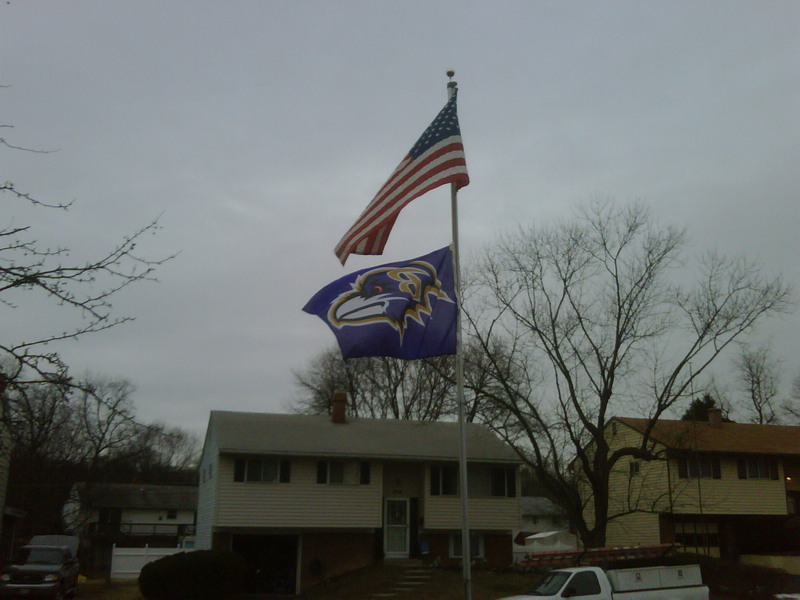 Ravens Traditions: The Flag Flies Again! Because I’m a bit OCD, I tend to accumulate a lot of what I call “traditions.” These are things that must be done at certain times, in certain ways, every time. My holiday routine is a prime example. Another example are my Ravens routines. We have one of those decorative seasonal banner posts in front of our house, on which we rotate appropriate displays. During the summer months, from it hangs a rustic American flag-type banner. At the start of each Ravens season, I hang the Ravens banner, which will remain until the team takes its first loss, after which time it will be replaced by our generic autumn banner. This banner returns in January should the Ravens make the playoffs, and stays until they are eliminated. Similarly, the 3′ x 5′ Ravens flag is hoisted on the day the Ravens qualify for the postseason, and remains until they get knocked out, when it is immediately removed. When I come and go from my house, seeing that the big Ravens flag still flies can be a misty moment. Inside the house there are traditions, too. 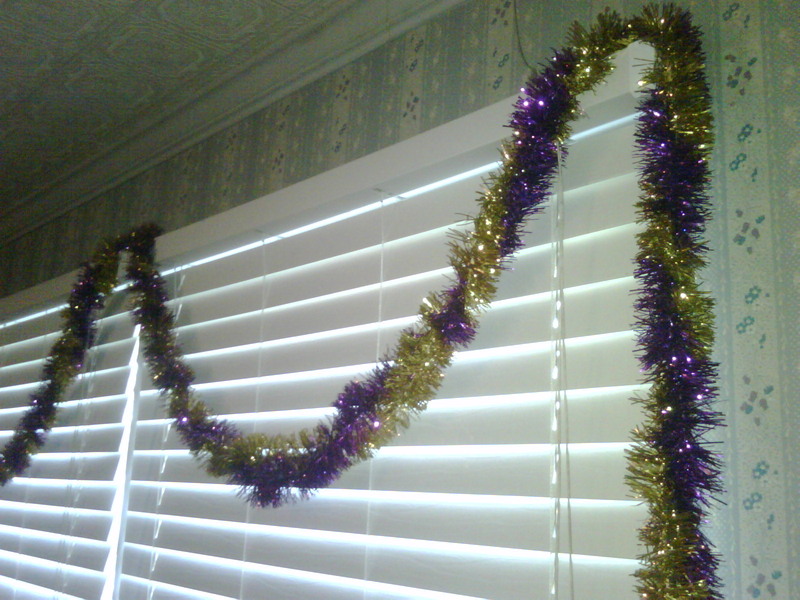 As a part of my Christmas decorations, I use intertwined purple and gold garland around the living rooms windows to reflect my allegiance not just to the Ravens, but also to my secondary team, the Minnesota Vikings. (I became a Vikings fan at age 7, back when Fran Tarkenton and the Purple People Eaters ruled the NFC. They were a good backup to the Colts during some lean years, and then, when the Colts left, the Vikings filled in quite nicely until the Ravens arrived.) 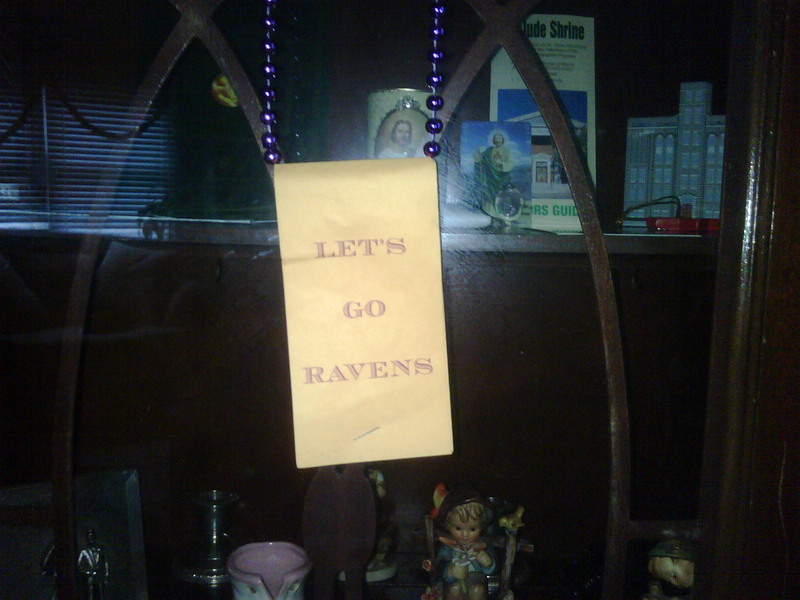 This garland will be in place until neither the Ravens nor the Vikings are alive in the playoffs. And then there are other items that get added haphazardly, and, because they are small, end up in place year-round. Falling into this category is a beaded necklace with a paper message that was given to us sometime last year, and now permanently resides on a curio cabinet in the living room. Of course, there are apparel traditions to uphold as well. While the Ravens still play, I observe Purple Fridays at work, sometimes adding my gold UMBC necktie. My wife, who works in the medical field, wears Ravens scrubs to work on the Monday following a game. On game days in warm weather, I wear my Ray Lewis jersey, switching over to one particular long-sleeve jersey/sweater once the weather shifts. 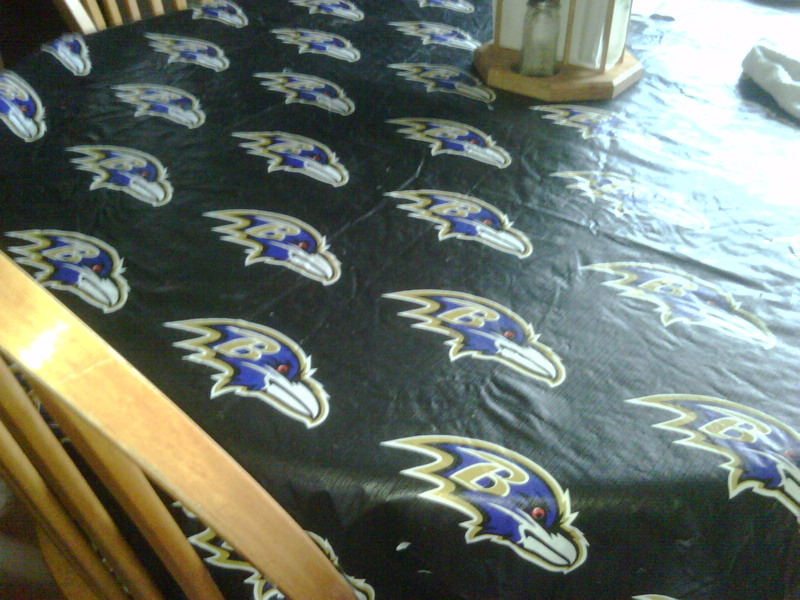 My wife usually wears her Joe Flacco jersey, but she’s not neurotic about it like I am. 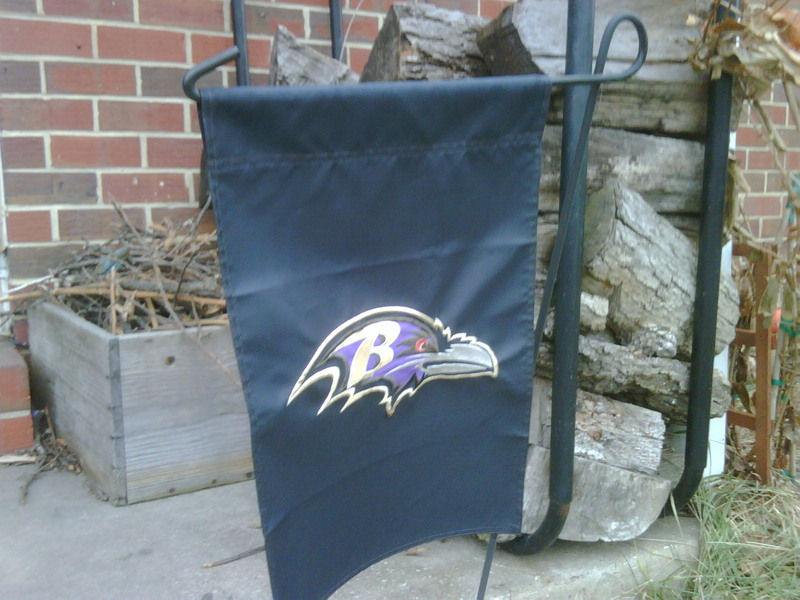 So, now that the Ravens are in the playoffs, the flag flies once more. Let’s just hope it has a chance to get a bit weathered before I’m forced to haul it down again. Sorry to hear about your season being over. I loved reading about your traditions – all these odd things really add to the feeling of being part of the team, doing your little bits to get luck on your side. One thing I do when watching the cricket is to not let my feet touch the ground when a score is on 87 (the Australian devils number for cricket = 100 – 13). Heaven help me if that’s the score at the end of a day’s play! Question for you: Did you leave the flag at half mast for a bit or does it come straight down?